At first glance it’s not always easy to see how those in our Christian family resemble us. The likeness is there, though, and looking again, we can usually find it. When Steven Berger arrived at Unexpected Joy, I didn’t need a second look. Just minutes into our first lively conversation, I recognized this converted Jewish hippie from Long Island as a brother. Steven is what I like to call a “paradise peddler”, a lay missionary with a penchant for the mystical. He works as head chef at Cafe Paradisio, the Redding, California restaurant he owns with his wife, Barbara. But Steven’s real job is selling heaven to everyone he meets. 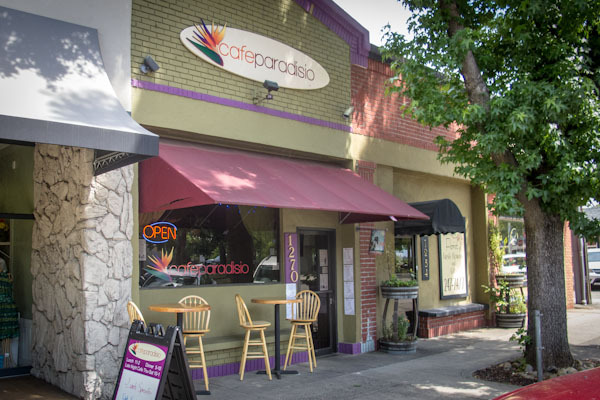 My guess is Cafe Paradisio wasn’t named on a whim. The teaching that we can become “partakers of the divine nature” (2 Peter 1:4) and be restored to the paradisaical state is a favorite theme of Steven’s. The truth of this doctrine of “theosis”, so central to the Orthodox Christian faith, is exemplified in the miracles that naturally occur around fully sanctified, or “deified”, people—those holy humans we call saints. The beauty of theosis, though, is that it isn’t limited to saints. Or, to put it a better way, we are all called to be saints (Romans 1:7). Anyone who has set forth on the path to salvation is already being transformed, renewed, restored. When Peter dropped his fishing nets and followed Christ, he began in that moment the process of theosis. He started to be deified, began to become like God. It was this process taking place that allowed the future great apostle to walk on water as Christ did, though he was not yet a saint. We know from the scriptures that it didn’t take Peter long to become afraid, succumb to gravity, and fall back to earth. But for that brief suspended moment, walking on the waves, Peter was allowed, by the One “through whom all things are made”, a glimpse into his full human potential. Recently, Steven shared a story with Orthodox in the Ozarks that he believes illustrates theosis at work, though in an unlikely place and through an unlikely person: a priest whose great-grandparents were slaves, serving Divine Liturgy at Unexpected Joy Orthodox Christian Church in his tiny hometown of Ash Grove, Missouri. So, like the dummy I am, by next morning, I forget all about it and don’t say anything to anybody about it. Then comes the part in the service where Fr. Moses comes out with the Holy gifts to pray for the living and the dead. He prays for the usual people and any other special needs he knows of and then turns to go back into the Altar. Suddenly, he stops, comes back out and prays: ‘And for all those in a coma’ and goes back into the Altar. I think what Steven’s story illustrates best is that while theosis is an exalted final state, it begins in a very humble way: with obedience. Most of us will not become miracle working saints, but we might, by obedience, be given gifts we hadn’t thought were ours to receive. Christ says, “come,” and Peter obeys, stepping into the sea as if onto dry land. A priest is prompted to pray for “those in a coma” and so he does, only to learn later that there was a reason for his prayer he himself had not known. And with such strong evidence that the Holy Spirit is at work in others, we get the chance to believe that He is also at work in us. Just another moment in paradise.